Next week, dozens of volunteers will travel from all over the state to take part in an annual highlight of our work on Virginia’s Eastern Shore; the collection of ripening eelgrass seeds directly from plants growing in local coastal bays. The Nature Conservancy has partnered with VIMS on efforts to restore seagrass beds to coastal Virginia for nearly 15 years. 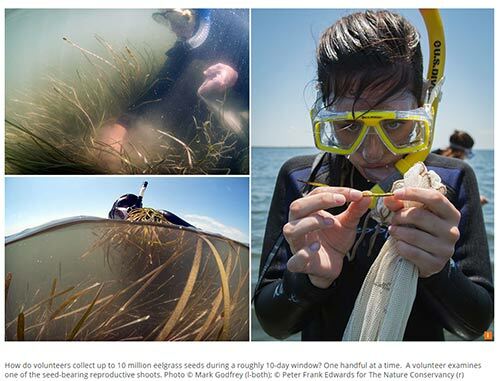 Over that time, VIMS and TNC have broadcast more than 70 million seeds to bays around VA’s barrier islands, which are now home to over 7,100 acres of eelgrass. Those eelgrass beds provide crucial habitat for a wide range of creatures, including blue crabs and bay scallops. Volunteers will travel to the sites via boat, don wetsuits and snorkels, and spend several hours diving for seeds, which are then brought back to water tanks to be separated, cured and prepared rerelease in the fall. We’re inviting a small number of interested journalists to join us on any day that might fit their schedule to see the work first hand, speak with our experts about why seagrass is so important, and hop in the water themselves if they’re up for it. You can see photos from one of last year’s trips here. Dates and Times: Below are the dates and times of potential collection. Trips will last from 5-6 hours. All times are meeting at the Oyster Boat Ramp in Oyster, VA.
Tues, May 29: 1 p.m. Wed, May 30: 1:30 p.m.